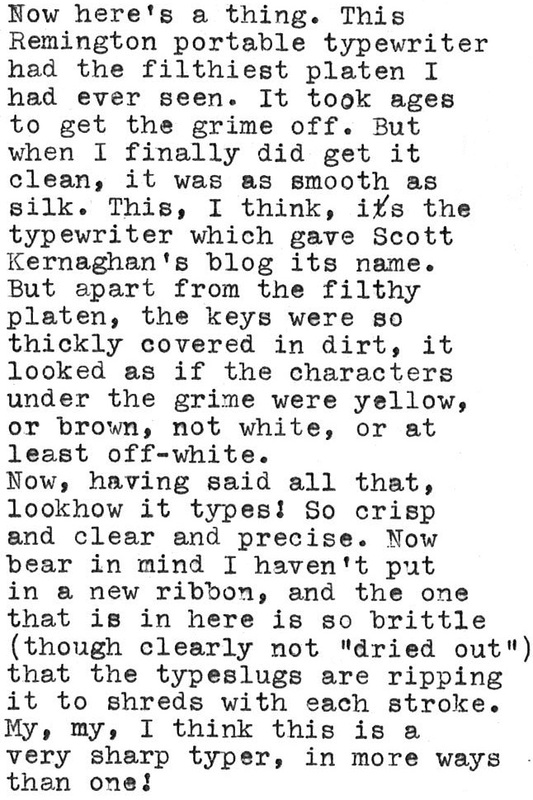 oz.Typewriter: Filthy Platen, Filthy Keys, but a Really Clean Typer! Filthy Platen, Filthy Keys, but a Really Clean Typer! Another day, another Remington portable, of the exact same vintage. The second this week arrived last evening. The first was a gift. I wasn't to know I was to receive it, not until I saw it on Monday afternoon. By then the second was already on its way, far too late to stop it. The case for the second gave every hope that this one would be in even better condition. I opened it and the first thing I noticed was the colour of the keytop characters - a deep yellow, or even brown. Not all that appealing, But the more I looked at them, the more I realised the keys were covered in a thick film of filth. Really, really, stubborn, deeply ingrained dirt. I started cleaning them, and the ones I cleaned came up looking as they are supposed to look, whitish. I decided not to complete the job, but first to photo the clean and the unclean keys on the one keyboard. Then I put in some paper and typed. Wow! Tiny bits of ribbon went flying in all directions. The typeslugs dug in and as they retreated flicked off black specks. 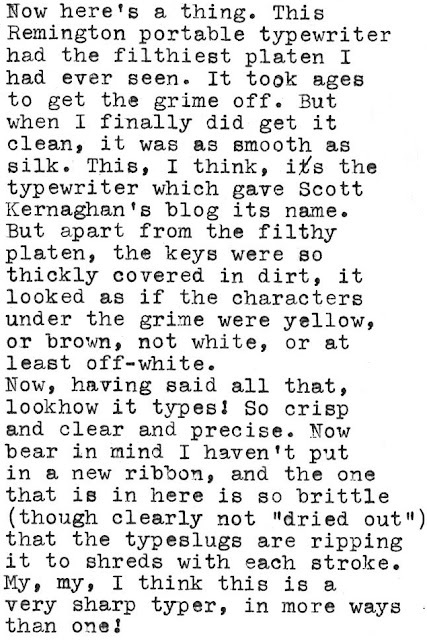 The ribbon was obviously extremely brittle, yet somehow still full of fresh ink. When I blew away the minute black confetti, what I saw was the crispest, cleanest typing. Amazing! So I decided to photograph the whole machine, and took out the paper. Filthy platen? Mr Kernaghan, you ain't seen a filthy platen like this one! I scrubbed it with fast-drying Shellite, and after some time the dirt finally began to lift. Underneath was one very smooth platen. Oh typewriters, will your surprises ever cease? Love this post! I have an Underwood Champion that had a similar amount of grime on the keytops, though the rest of the machine was in clean condition. And that type sample looks very sharp indeed. It's true, every typewriter holds a surprise. I have one of these on its way to me too -- a slightly later version with big squarish keys. I think we've all been there, what with the filthy keys and all. Amazing what a little elbow grease can do though, huh? Incidentally, I think my Remington Envoy is the cheapy-er version of that one there, as the chassis looks very very similar. Filthy platens, filthy keys! I'd feel right at home. I've been trying to chase down a model from this era, as I think it suits the theme I've rather decided on in my collection. However, I'm chasing down quite a different colour. You've done a stunning job though. That machine looks magnificent!